The Marple Website has now donated over £10,000 to local good causes! 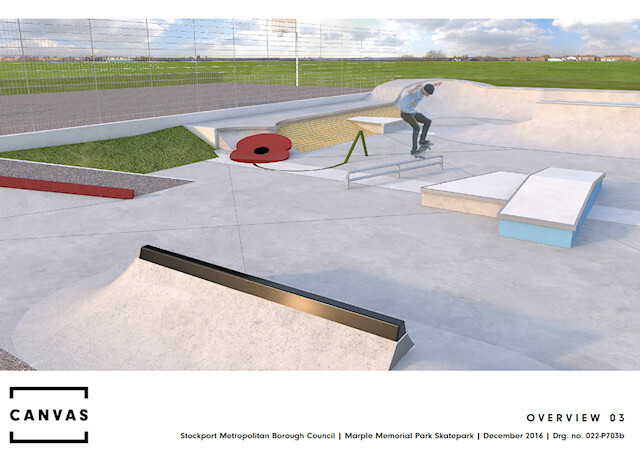 This year's donation of £1,000 to Marple Skatepark Development Project from the banner advertising income on The Marple Website, the Marple Community Forum and the Virtual History Tour of Marple, means that a total of £10,050 has now been donated to local good causes since 2006. This has been possible due to the excellent support of the local businesses who pay for low cost advertising on these sites. In 2011 £1,000 was donated to Friends of Marple Memorial Park for their Diamond Jubilee Project. In 2012 The Marple Website became the main sponsor of the Marple Christmas Cracker with a donation of £1,000 to Marple Business Forum. £500 was donated to the Skate Park Project in 2013 - this was matched by Forever Manchester, effectively doubling our our money. In 2014 a further £1,000 was donated to the Skatepark Community Match Funding. In 2015 £500 was donated to Friends of Marple Memorial Park and £350 spent on sponsoring Marple Athletic JFC Under 12s for the 2015/16 and 2016/17 seasons. The 2016 donation takes the banner advert contributions over the last 6 years to £5,350 and the overall total donated to local causes by The Marple Website since 2006 to £10,050! That's an average of £1,000 a year for the last 10 years! How many other community web sites or Social Media platforms can say that! A banner advert is a great way to promote your business and support your local community web site at the same time. There's also a sponsors' area of the forum that advertisers can use if they wish. The banners are only available to local Stockport based organisations and businesses, so if you're interested in promoting your local business on the site have a look here, and get in touch. Nearly 3.2 Million image views on the Marple Website Virtual Tour! As I write, the counter on the Virtual History Tour has reached 3,187,123 image views and there are more than 11,360 local images shared. Another year focused on the skatepark project means that the Virtual Tour has continued to take a back seat but we've still managed to add over 850 photos over the last 12 months. The total number of images on the Virtual Tour has now reached 11,364 and they've been viewed an amazing 365,641 times since Christmas 2015. There are still many images from Marple Local History Society's Archives to scan and a significant number of postcard images provided by collector Janet Holmes still to upload. So the Virtual Tour is set to continue growing throughout 2017. Last year I mentioned another collaboration between The Marple Website and Marple Local History Society that I though would be launched in 2016. This has taken longer than I expected but is progressing well and should be revealed early in 2017. As usual, local photographer Arthur Procter has put in a big effort to record most of the events that have occurred in Marple over the last year and his excellent contributions have included Hawk Green Maypole Event Marple Carnival 2016, Installation of Red Wheel Plagues at Posset Bridge and Marple Aqueduct, Mellor Country Fete, Marple Fire Station Open Day, Mellor Mill Fact and Fun Day, Marple Food and Drink Festival, the Remembrance Service in Memorial Park and Marple 2016 Christmas events. Jake Taylor has also made a welcome contribution to recording local events with some great photos sent in this year. 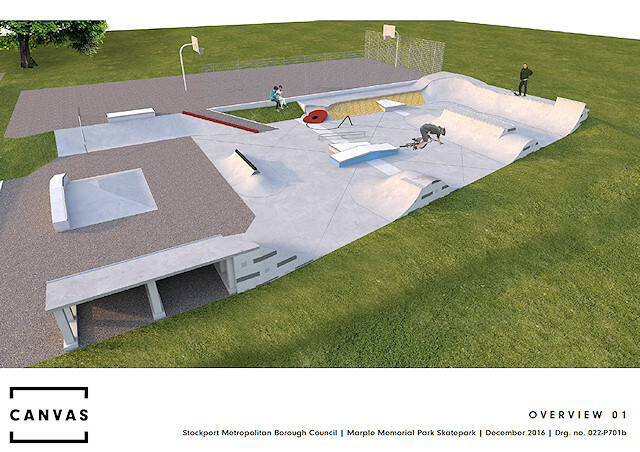 Marple Skatepark Fund-raising target of £100,000 Reached! This time last year I reported that Friends of the Park needed to raise another £22,394 to reach our funding target of £100,000 for the Skatepark Project. I'm delighted to announce that this was achieved on Tuesday 20 December 2016, when we received a fabulous donation of £1,185 from Marple and Goyt Valley Rotary Club during their final ever meeting at the Royal Hotel in Hayfield. The project has received brilliant support from Marple and Goyt Valley Rotary over the last four years in return for the help we gave the club with their Christmas Collections in the Co-Op / Asda. This year Friends of the Park took over the collection completely and Asda customers generously donated a total of £1,876 during three days of collecting in the store last week. £2,500 CDL Fund Grant Award via Forever Manchester. £1,684 Local Events Carnival, Food and Drink, etc. £1,500 Marple Area Committee Flexibility Fund Award (2016). £1,200 Friends of Park Refurbishment of Town Centre benches. £1,120 SkateFest Music night at Hawk Green CC. £1,003 #GiveMe5 + miscellaneous donations via Local Giving. £992 Grow Your Tenner 2016 - matched donations via Local Giving. £988 Grow Your Tenner 2015 - matched donations via Local Giving. £941 Julian Wadden Treasure Hunt. £901 Christmas Collections with Rotary 2015. £856 Art Auction of donated paintings photos and books. £600 Raised by Marple Hall School. £500 Rotary Club of Stockport donations. £420 Hatters and All Things Nice (2015). £400 Local MP William Wragg's Charity of the Month. £250 Tuesday Bridge Group donations. £250 ASDA Chosen by You Community voting scheme in store. £240 Marple Soup Community donations. £224 KC Dowling commission on book sales. £158 Ring o' Bells Quiz Nights. £100 Nationwide Community voting scheme in branch. £132 Oldknow Bar donation and collection. £59 Easy Fundraising commission on Internet sales. £50 Romiley and Marple Lions donation. In anticipation of reaching the target this year we've met with the nominated contractor Canvas Spaces and the Council several times since August. There have been some issues with the impact of inflation on the 2014 tender prices and we have had to remove some scope and tweak the design to keep the project within our budget. We recently agreed a revised design that addresses this and have also agreed that Friends of the Park and the council will do some of the landscaping works. The next key step is for the council to place an order with Canvas so that materials can be ordered and construction can begin. We are currently waiting for a final documentation package from Canvas before the order process can be concluded and should have more news of that early in the New Year. 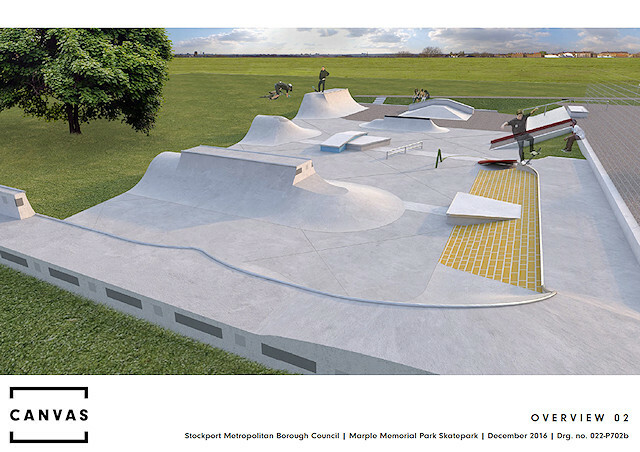 There are some new issues that we'd like to address with the skatepark that are not covered by the current project, for example the old tarmac surface has recently developed pot holes in places around the existing ramps. We would like to find a long term solution to this if possible, and also find ways to improve the top section of the existing skatepark and the basketball area. So for the immediate future we will continue fund-raising in the hope that we can find a way to tackle these issues too. Finally for now, on behalf of Friends of the Park and the Skatepark Team, I'd like to say a very big thank you to all the local people, local organisations, local businesses, local schools, local councillors and the council themselves, for supporting our efforts since we started this project 5 years ago, and having enough faith that we could do it to give us your money. We've had no grants from national organisations such as the Lottery or Sport England and ALL THE MONEY for this project has been raised at a local level. It's quite an amazing achievement really, so well done Marple - we've done it for ourselves! Local people need to keep making a contribution! I say every year that The Marple Website thrives on its visitors coming back again and again and it's all about the local community making contributions and keeping the site fresh, active and alive with new information. This year the forum is hanging in there but has been very, very quiet at times. The statistics show the lowest annual figures since 2010 and there has been a steady decline in local people using it. This is largely due to the growing dominance of Facebook and Twitter in people's lives, and the newer Streetlife, which seeks to take over for profit at a national level the role that all the small individual local forums like ours have fulfilled for many years. The only way to combat this decline is for more people to use the facilities provided. In the long term - use it or loose is a distinct possibility. There are many ways that people can do this, including registering in the forum and posting your two-penneth in the variety of topics discussed there, or publicising your organisation's activities in the Events Calendar. Independent contributions and articles on local history, attractions or other matters of interest to the local community are particularly welcome too. 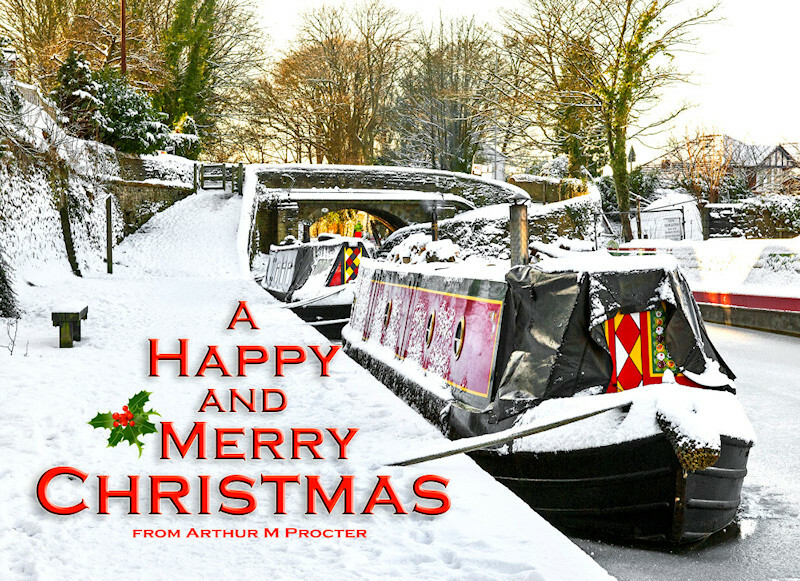 At Christmas 2014, and again in 2015, I hoped that the coming year would see the launch of a major upgrade of The Marple Website - a daunting task due to the sheer size and number of pages that have been building since 1998. Unfortunately due to the demands of the skatepark project I've hardly touched this in 2016. Will I be able to turn my attention to the upgrade in 2017? I hope so, but no promises made! Thanks as always to Howard for help moderating the Forum and to Arthur Procter for his wonderful photographs. Thanks also to everyone who supports the site by coming back to see what's new - that's the most important thing of all!